From Blue Planet II, to major developments towards reducing unnecessary plastic, this year people have been motivated to care about the environment in a way they never have before. For its 15th annual Recycle Week (24-30 September), Recycle Now is capitalising on this energy right here in Hounslow; tasking residents – and people all over the UK – to build on this momentum by now focussing on getting our recycling right during Recycle Week. Why? Because Hounslow DOES recycle. Because it matters. With billboard advertising across the nation, a national tour, and a huge scale digital campaign, this year’s Recycle Week is the biggest and boldest yet; celebrating the fact that more and more of us are recycling. In fact, as a nation we are recycling more than ever before, but it’s important that we get it right. New research from Recycle Now shows while people in the UK say doing their bit for the environment is one of the primary motivations for recycling; over three quarters of UK households (76%) add one or more items to their recycling collection that is not accepted locally, which can be problematic in the recycling process. Meanwhile more than half (54%) put at least one item in the general rubbish that could be recycled. But fear not – Recycle Now is here to help! Hounslow is a borough of recyclers – but there are some simple things that we can all do to make our recycling even better. Recycle more of these items: bottles of bleach, or any other cleaning products, including the nozzle, skin care bottles, shampoo and shower gel bottles, cereal boxes, dishwasher tablet boxes, aluminium foil and trays. Make sure these never go in the recycling bin: Plastic Bags, cling film, thin plastic such as from bread or salad bags, polystyrene, crisp packets, pet food pouches, toilet paper, tissues, wet wipes and used paper towels. And if you’re at all unsure about how to recycle a specific item, remember that Recycle Now’s Recycling Locator can show you exactly what needs to go in the recycling bin where you live. Recycle. Hounslow does. Because it matters. “Hounslow fully supports WRAP’s new Recycle Week campaign as it’s a great way of raising awareness of recycling, not only in our borough, but across the UK as a whole. More than ever, people want to look after our fragile environment and recycling is one of the key ways that everyone can take action to care for the planet we pass on to future generations. “Like all London boroughs, Hounslow has a recycling target, set by the Mayor of London to recycle 50% of our waste by 2020. At our current level of 31%, it’s clear that we still have a lot of work to do. We are committed to working with our residents to help them to recycle more. 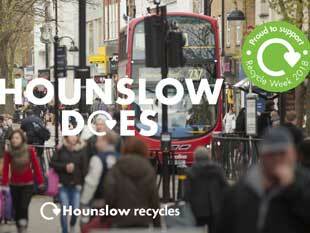 Hounslow recycles because it matters.